Ready? So, as I said, he is such a talent and his quilting output is a thing of enviable beauty. 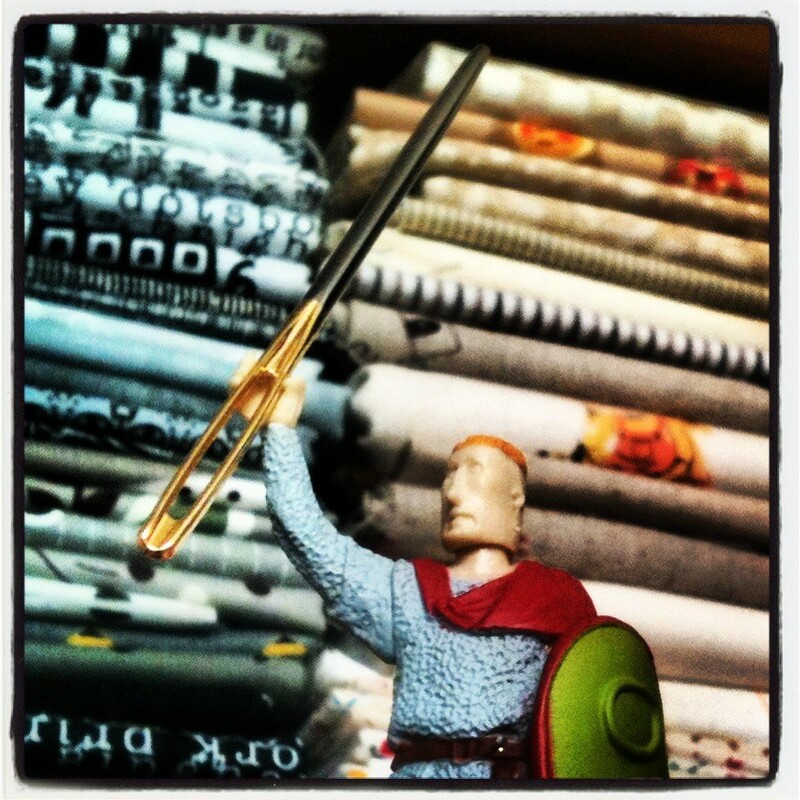 I only hope that as I travel my quilting journey I’ll match the smallest part of his awesomeness! For his month, G requested complete and total scrappy chaos! We were tasked with making any blocks, any size; one behemoth, or several smaller; squares, rectangles or triangles were all fair game. The only real request was that the blocks were in colour order and any background was neutral or low volume, so as to achieve a scrappy, tea-stained looked. I was in my element and couldn’t wait to get started! 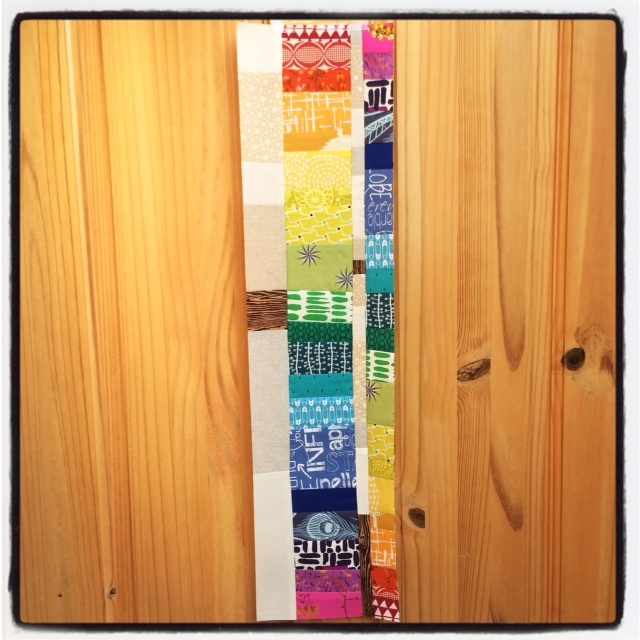 I had no end of scraps to rummage through, and began but pulling a few from each section of the colour wheel; solids, prints and some amazing wood grain that I jump at the change to use. Then I just got down and dirty with the sewing machine, sewing this to that with a vague plan forming in my improv-induced creative coma. It was great fun! These blocks were so addictive, I could have easily carried on making them all day. 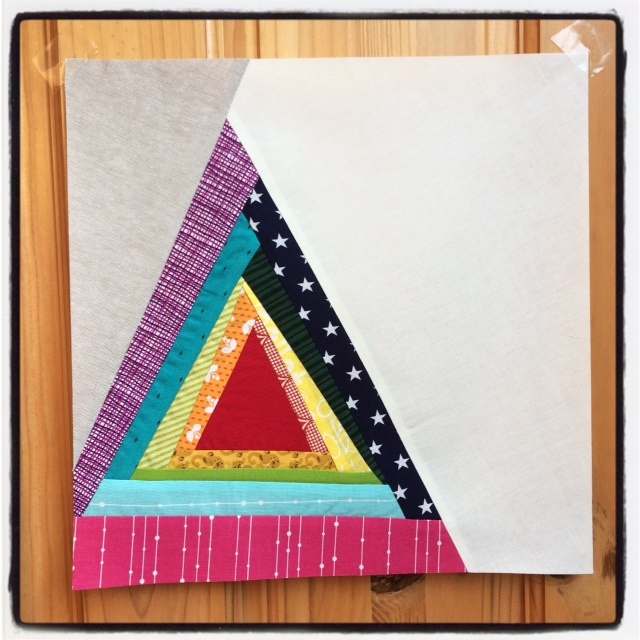 I made the first two, yet my appetite for rainbow piecing wasn’t quite sated, so I made one more. The rectangular one is long, finishing at around 24″. I so excited to see how G fits all these pieces together. 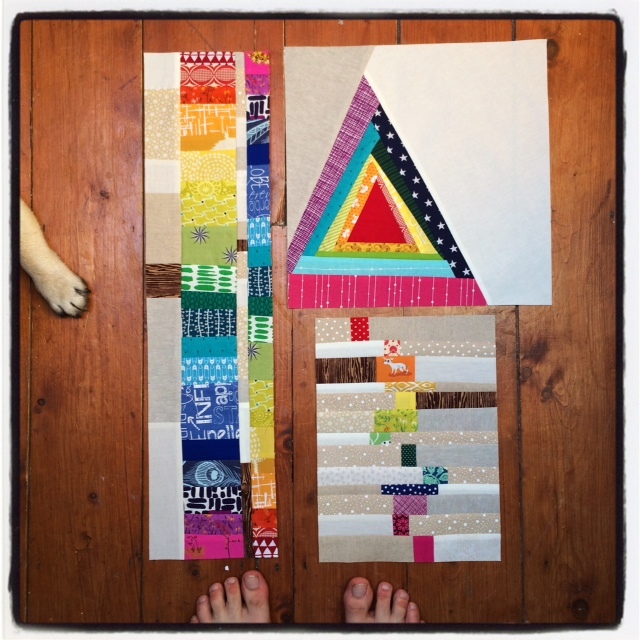 From what I’ve seen of the other blocks this is going to be one awesome quilt. This last photo is a homage to G and includes not only my feet but one paw of a certain pug. He loves getting in on the bee action too! I was surprised my how resourceful ones stash can actually be. When I saw the block instructions called for tea-stained fabrics, I was thinking “am I gonna have to do a spot of home dying here?”. Surprisingly, I had a lot more neutrals than I thought. The lesson learnt? 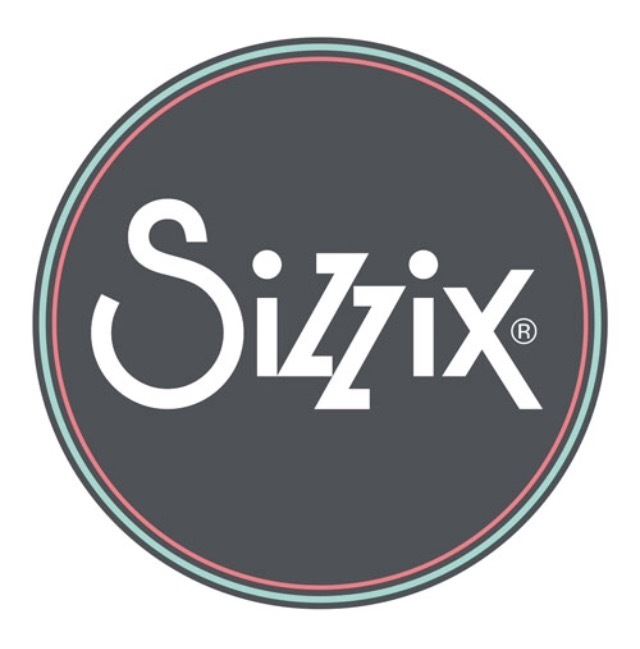 You don’t always have to run to the fabric shop…sometimes you can walk! October is my month of the bee and I can’t wait to see what all these amazingly talented guys come up with for me. 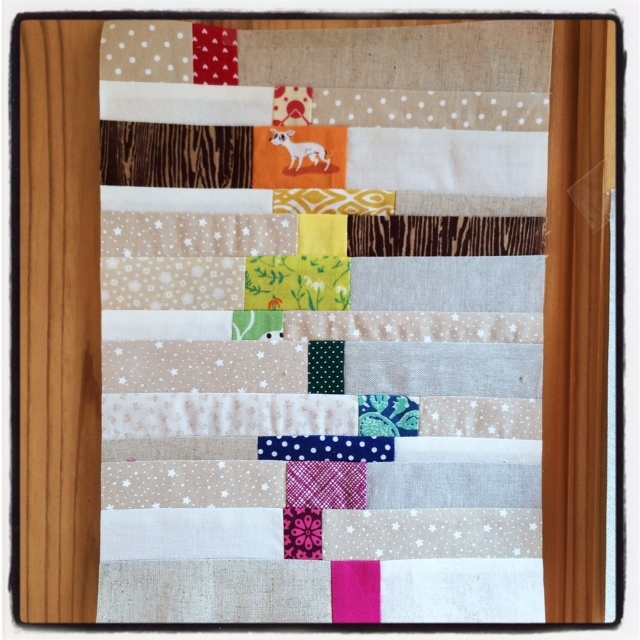 I’ll be sharing the details of what I’ve requested soon but for now, I’m off to work of my November blocks. Remember to follow along on Instagram with the #NGAQB hashtag. Sandy, Mr January, has just had his top long arm quilted and the results are stunning! Go forth and drool! Oh fabric, how I’ve missed you! Not sewing with you, because there’s been a lot of that going on lately, but buying you. Of that, there hasn’t been so much. In fact, I’ve been missing from Sunday Stash for such a long time. It’s great to be back! I feel like Bette Midler, who, after almost thirty years, is returning to these shores for a series of concerts. 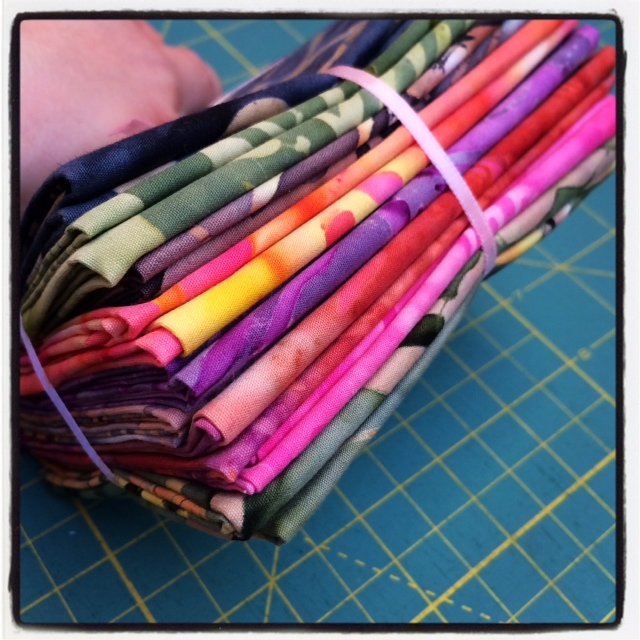 Some say love, it is a river…I say it’s finally getting your hands on fabric you bought who-knows-how-long-ago! You may remember a long while back I had a number of fabric acquisitions sent to my American Mum’s house for safe keeping. She really is the greatest and lets me use her home like a post office come storage unit for those times when I simply have to have something but the seller won’t ship international. Having such a place also allows me to enter international competitions my UK abode would otherwise prohibit. It’s not what you know but who, right? One of my quilting besties Kelly (the_orriginal on Instagram) is visiting the UK soon and offered to be a fabric mule for me…again! Although I didn’t have the funds for any new purchases, I thought it was the perfect opportunity to get some (I couldn’t burden her with it all) of the fabric in storage to this side of the pond. What I wasn’t expecting was for the rest to arrive in a lovely care package, completely with Napa Valley roasted coffee and lots of chocolate. Thanks Mum! Expect a lot of fabric sharing in the next coming weeks as I’ll be meeting up with Kelly to retrieve the rest, but for now, here’s a few of the beauties. 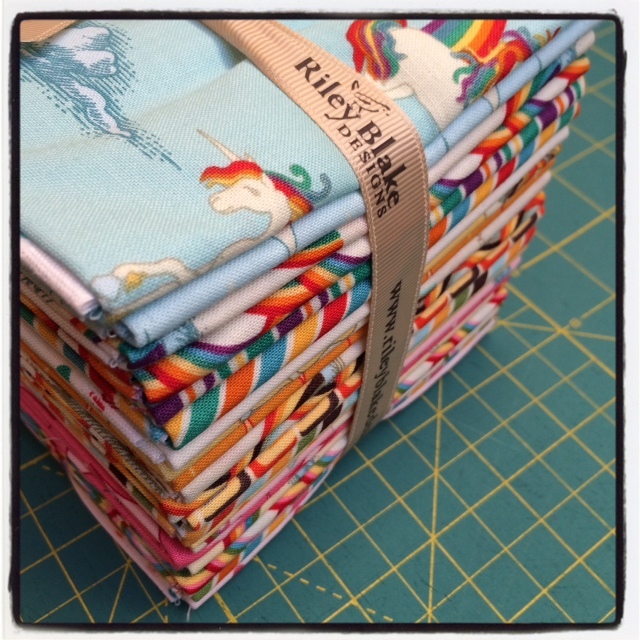 To be honest, I completely forgot I bought this awesome Unicorns and Rainbows bundle by Riley Blake Designs. I mean, what fabric stash is complete without fabric like this? Bright, bold and fantastically fantastical. Anything with unicorns on is sure to be a winner with me. Second up is something I wasn’t expecting. A beautiful bundle of hand-dyed batiks from Hawaii. American Parents visited recently from Napa and picked this up for me. The fabrics are so much nicer in person and no justice whatsoever is done my photography. These will be saved for something very special. I’ve never used batiks before and will have to wait for the perfect project to justify cutting into them. 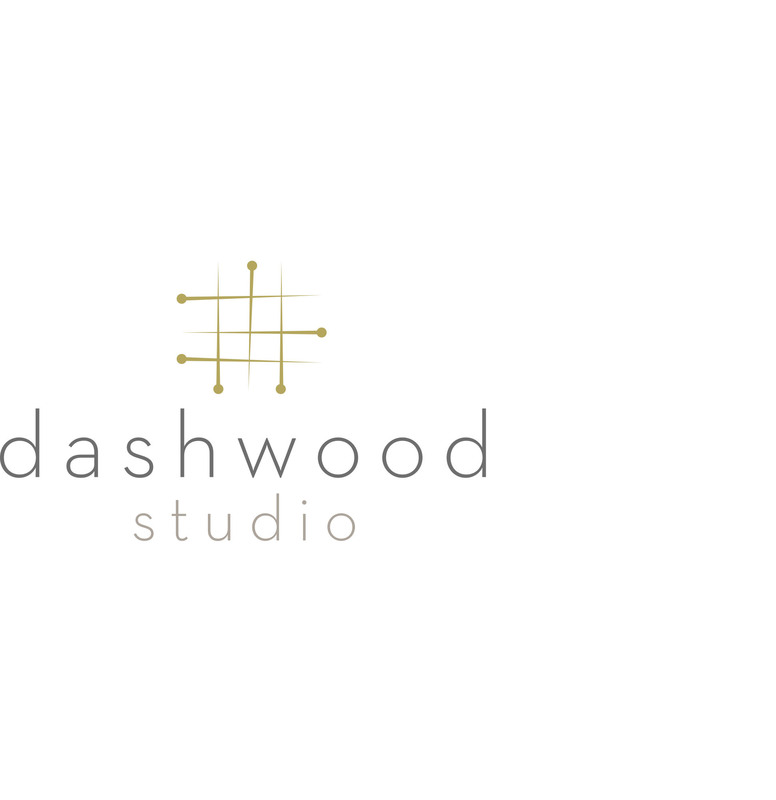 As I said, lots more to come, but for now check out all the other additions people have been making. There’s a bit of a celebration going on over at Molli Sparkles today, as Sunday Stash reaches triple digits! There’s a prize to be won, and maybe some cake.